In all the talk about the Scarborough Subway and SmartTrack, there has been much less discussion of how the surface route network will be adjusted around the new lines. 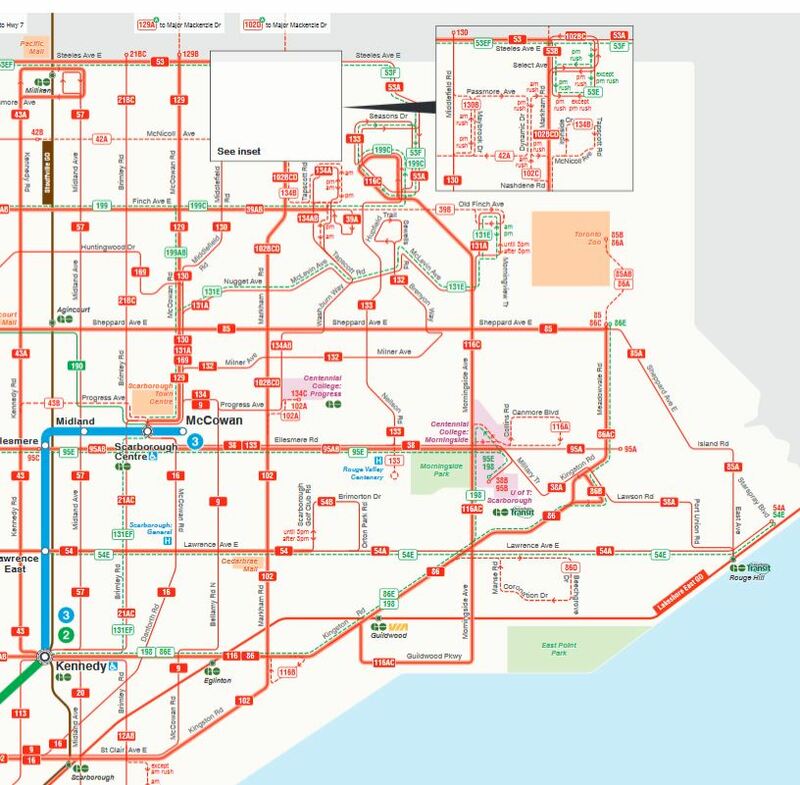 In preparation for Council’s upcoming debate on the SSE, the TTC has produced a map of the proposed bus network following the subway opening. Here are the current and proposed maps for comparison (click to expand). Many of the routes on this map are unchanged from the current network which is already built around the Town Centre and Kennedy stations. What is quite striking, however, is the complete absence of services dedicated to existing GO and potential future SmartTrack stations that are supposed to be an integral part of a future Scarborough Network. 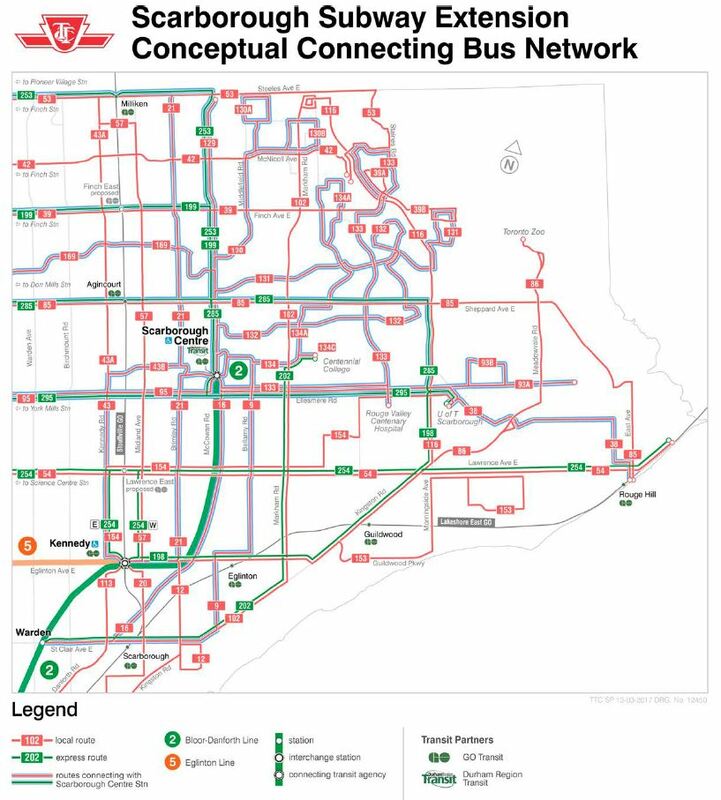 Inclusion of connecting service to those stations would presume, of course, that ST will actually operate as advertised with frequent service and free transfer to and from TTC routes. There is also no Eglinton East LRT to the UTSC campus. Looking at the map, and the degree to which “all roads lead to STC”, shows the effect of having a major “mobility hub” in the middle of Scarborough. If that’s where you want to go, there is a bus route to take you there. Other travel patterns can be more challenging, especially if the peak service hours are designed for downtown-bound commuters. Rearranging the network to feed into SmartTrack would require some work, and it is unclear if multiple hubs could actually co-exist. However, SmartTrack is planned to open five years before the SSE, and will trigger its own interim changes. Without really intending to, the TTC has given us a view of Scarborough transit that is uncomfortably closer to what might actually be built than many, certainly Mayor Tory and his circle, would care to admit. Meanwhile, the SSE does not bring the same degree of change to the surface transit network as might occur in other areas because STC is already a major transit node. Indeed, the TTC could introduce new and revised routes long before the subway opens in 2026. Science Ctr Stn to Starspray via Kennedy Stn Replaces 54E express. Link to Kennedy Stn added. STC to Kingston Rd Replaces 95A York Mills east of STC. Route number already in use by 93 Parkview Hills. Kennedy Stn to Steeles Extended to Steeles & Markham Rd. Service via Guildwood replaced by 153.